Image courtesy of pfala’s photostream. Whether the company is big or small, everyone has a budget. Your goal is to make every dollar count and we are here to help you do just that! To get big results on any budget, keep a few things in mind. First, look at what you’ve done in the past. What’s worked and what hasn’t? Get rid of the bad and keep the good. Don’t change a campaign just because you are bored of it—change a campaign because you aren’t getting the customer response you want and need, otherwise leave it be and keep it up to date! Be smart about your traditional advertising. If you are going to spend the big bucks on print, TV, and radio advertisements, use them wisely. Always include a call-to-action and multiple ways for the target to contact you: phone, website, email and address. If you choose to distribute printed handouts or direct mail pieces, order them in bulk and redistribute on a monthly/quarterly/annual basis. Always use both sides of the printed piece—whether it’s for advertising, product specifications, or a map—you pay for the space, use it! Remember who you are and what your company stands for. Your personality should consistently show up throughout any advertising you choose to participate in. What does that mean? If you are advertising for a new landfill, would you print on the highest quality, gloss stock paper with texture? Or would you choose a recycled, one color simple printed piece? Explore less expensive (often times free) alternatives. This can be digital banner advertising—it’s a high upfront cost but the audience and ROI is equally high! Ensure that you do all you can with your PR agent. Submit press releases on a regular basis and tie yourself into local causes and benefits. Don’t forget to optimize all of your digital activity with key words and phrases. This can be applied to your website as well as press releases, documents, and videos you post. • Become a member of your Chamber of Commerce and NETWORK! • Social media is your friend and it’s free—blog, post, tweet, etc. • Do what you can to support the local community: fundraising, support, volunteering, etc. a. Figure out who your best target audience is for your product line. b. After you figure out who your best target audience is, you will then need to determine the best way to reach them. Is it by advertising in the paper, or finding them on online sites such as Twitter or LinkedIn? a. Include a good description of your company and a link to your website. b. Join groups or conversations that talk about the type of products or services you are trying to promote. Also, participate in the conversations. Be consistent and have the same information on your letterhead paper and any handouts you create. If you already have stationery and any of this information is not on there or you have any information that is not up-to-date, make sure you correct it and change everything to be consistent. 4. Set up a free listing for your company on search engines’ local directories. You can do this on all major search engines such as Google, Bing and Yahoo. Be sure to include your website link and a description of your business. 5. Website. If you don’t have a website, set one up. You can pay for someone to do this for you, you just have to tell them what design you are looking to achieve. If you can’t afford to have someone custom-design a website for your company, there are free sites such as wordpress.com that you can use to put your own site together. WordPress and other blog sites provide you with the templates and tools that make it easy to create a basic website. In order to effectively start and grow your company, you will need to attract and then work to retain a large base of satisfied customers. These items will help make it easier on you to effectively market your company so you can take your business to the next level. If you mostly sell promotional items but dabble a bit in print, don’t target ‘printing’ as one of your keywords. Make sure you are getting as specific as possible with your keywords – find the best fit for what you are selling. Using too broad of keywords may send a bit more traffic to your site, but untargeted and unwanted traffic is just wasting your efforts. If a broad keyword like ‘shirts’ gets millions of searches a month, it must be worth using for a keyword, correct? Wrong. ‘Shirts’ may get millions upon millions of searches, but the majority of the searchers are untargeted and uninterested buyers to someone selling branded shirts. ‘Branded shirts’ may get far less search volume, but you’re getting an audience that has more interest in your product. Make sure you’re not too concerned about search volume or you may be missing out on keywords that can boost your business. In closing, make sure you are staying on top of your keyword research. Remember that keywords are not set in stone – just as search behaviors and terminology is evolving so should your keywords. My recommendation is to re-evaluate your keywords every 6 months or so, to make sure you are using the most effective keywords. Keeping up with your research and keeping these four common mistakes in mind can have your SEO campaigns running more effectively. The holidays are nearly over, the celebrations have died down and a whole year of possibilities is ahead of us. For your 2013 professional goals, you may want to either establish new contacts or maintain current ones, all while growing your business. But, do you have a plan in place to really meet these goals? Do you have a strategy for how you are going to leave a memorable impression with each prospect or client? - In the United States alone, respondents participating in ASI’s study each owned an average of 10 logoed promotional products. - On average, respondents keep promotional products for 5.8 months. - Eight out of 10 people polled said an item’s usefulness is the main reason they hold on to it. - Even after they are done using an item, 66% of respondents in the United States said they don’t throw it out; they give it to someone else to use. - Nearly nine out of 10 of respondents who have logoed promotional items can identify the advertiser on the items. - Almost 31% of respondents said they were more likely to do business with an advertiser they hadn’t previously done business with after receiving a branded item from them. 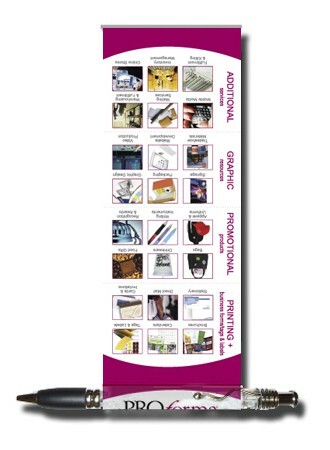 - Retractable Banner Pens. Not only do Retractable Banner Pens have a useful purpose, they also give you the opportunity to include a ‘mini-brochure’ about your business! The banner portion of the pen pulls out, providing ample space to review not only your contact information, but also your company’s capabilities and credibility. Maximize the space given by using both sides of the pull-out banner. - Wall Calendars. With the New Year upon us, now is the perfect time to distribute wall calendars prominently featuring your company’s logo. To really stand out and capture your contacts’ attentions, design your own calendar with a theme that complements your brand. - Custom-Shaped USB Drives. The ability to easily save documents and files on USB Drives is important to any business. Demonstrate you care – and have fun choosing a custom-made USB Drive that serves as a symbol of your business. - Compressed T-Shirts. Instead of just leaving behind a neatly folded t-shirt, go for a compressed t-shirt! Have the shirt branded with the design you create, and then have it compressed into the shape of your choice and shrink-wrapped to stay put. You can even include an insert card that provides even more information about your business and product line. The options are endless when it comes to promotional product leave-behinds. Use your creativity to get your foot in the door, and start growing your business! Are you trying to start a new business or attempting to grow your existing business? If you are having trouble coming up with ideas on how to establish or develop your business, here are five ideas to get you started! When it comes to Search Engine Optimization and keyword research, keep in mind that the keywords you select affect not only your search results ranking, but also what kind of traffic you are sending to your site. Keyword research can be one of the hardest components of SEO, and it’s easy to make a mistake along the way.